You’ve heard me talk about the “rut” throughout this hunt. 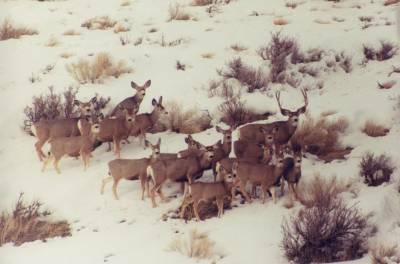 There seems to be much confusion on when the mule deer rut occurs in the West. One time while hunting in Montana around November 20th, I ran into a local hunter who seemed pretty knowledgable. That was until he said that the mule deer weren’t rutting that year! I’ve also heard the same thing when I hunt Colorado’s Third Season that always starts around November 1st. That’s like saying all the guys at the bar on Ladies’ Night are only there for the drinks. No matter what we may observe while in the woods, the rut is occuring according to the calendar. That is how God programmed the species and they can’t help but to obey. Talk to any good biologist and he’ll tell you the Rocky Mountain Mule Deer gestation period is about 210 days. He’ll also tell you the bulk of the fawns are born the first week of June. Subtract 210 days and you’ll find the rut going around November 1st through the 25th. Like most phenomenon, the mule deer rut follows a bell curve, so there will be a peak preceded and followed by rutting activity. It’s been my experience that once the kids are Trick-or-Treating, the rut has begun. I’ve seen big bucks checking does as early as October 28th (I killed one that lab-aged at 6-years old) and as late as early January. The peak seems to be around November 15th plus or minus a week depending on local areas (personally, if I could only hunt any five days, it would be November 15th-20th.) If the weather is warm, deer activity is low so the rut action can seem slow, but it’s still occurring by God’s timeclock as it has for centuries. Bring in the snow and cold, deer activity increases and the rut just becomes more observable. 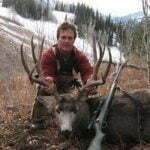 While I’m no scientist, I have spent nearly 35 years in mule deer country and can assure you that by early November in the Rockies, you better be checking those does- the buck of your dreams surely is! Love this series and all the info you’re sharing! Thanks! Robby, great so far! Can’t believe invites were turned down!! That is mule deer heaven!